Carole Middleton said that she has two lovely sons-in-laws’ and one day she would love to have a daughter-in-law. She recalled the 2011 royal wedding and she said that she just wanted to make Kate proud. She said all eyes were on her and the whole Middleton family, so she felt it was vital to impress William’s family. Kate’s mom went on to say that while she was stressed during the nuptials, she doesn’t think she had any additional stress compared to other bride’s mothers. She quickly added that there were so many people helping to make sure the wedding was a success. Middleton expressed her gratitude for Queen Elizabeth and how she has welcomed her daughter into the family. She said the queen is hands-on and a very involved grandmother to Kate’s children. Carole stresses that she told her daughter the importance of teaching Prince George, Princess Charlotte, and Prince Louis kindness and politeness towards others. She noted it cannot be something you start teaching when the kids are teens, it has to start young. After 30 plus years of successfully running a family business, Carole realizes that family is so important to the future. She said that family should always come first. Middleton admits that she still has some anxiety about her kids growing up and moving away. She said that with the family living all over England, it makes it difficult to get together for Holidays. 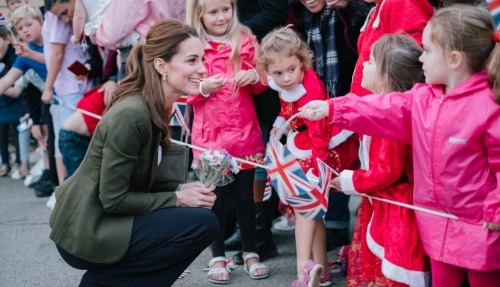 Are you surprised by Carole Middleton’s support of Prince William? Stick with CDL for more royal news and updates!